that delivers information safely and reliably with a small footprint. Fuse Service Works contains three main components - Core ESB based on JBoss Fuse, Service Framework based on Switchyard and Governance based on Overlord. Switchyard is a lightweight service delivery framework providing full lifecycle support for developing, deploying, and managing service-oriented applications. Switchyard is a implementation of some of the SCA specifications. 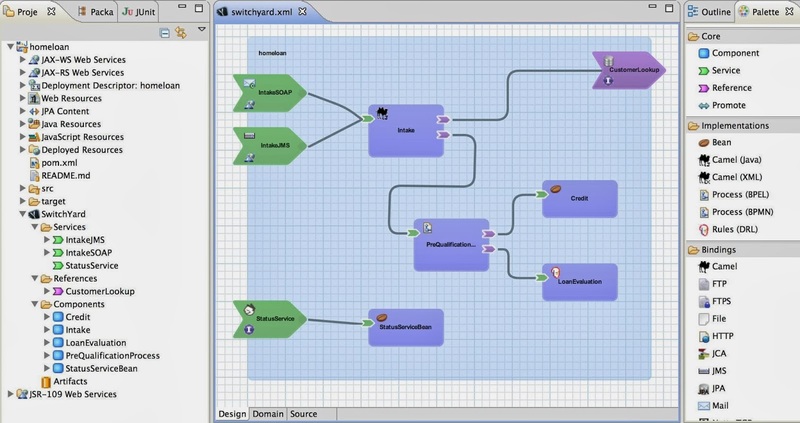 The Switchyard Designer below shows an example of a Home Loan Application with the Services/References/Bindings. Service Component Architecture (SCA) is a set of specifications which describe a model for building applications and systems using a Service-Oriented Architecture (SOA). 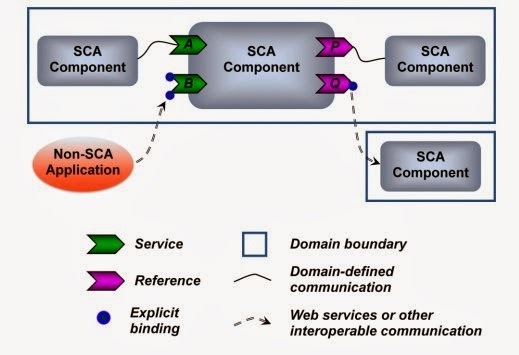 SCA extends and complements prior approaches to implementing services, and SCA builds on open standards such as Web services. This diagram shows services and references in relation to bindings. SCA essentially standardizes a conceptual model for the definition, structure and implementation of service-oriented applications. Even though the standard is defined there is no guarantee of interoperability or portability for applications across different vendors which are developed for an SCA runtime. So there is a big advantage in having the shared conceptual model between implementations as the user's view of the application will be similar across them. The implementation of the specifications that Fuse Service Works v6 follows are based on the merit and relevance of the specification and the ability to deliver it in the product. There are some parts that are useful which we have not implemented yet and others that customers may request which we can take on as feature requests. So the product team will continue to fill out our support for SCA specs as it makes sense for the product platform. One thing to keep in mind is that the list of specifications are in very different states of maturity. At this point Assembly is the most mature. There is not a master list of what's implemented and what's not. If there is something specific that is needed it is best to get an idea of what they're using and we can help line that up with what we have. This is where the product team invested the vast majority of our time as it represents the configuration model for the application. The coverage is not complete, but it is substantial. The most notable section missing right now is around packaging and deployment. We have our own packaging model which allows for JAR/EAR/WAR deployment at the moment. That said, there are certain elements of the SCA packaging model which are attractive to us (e.g. recursive composition) that may make it in a 6.x release of FSW. This is partially supported. SCA Assembly pulls this in and we support the transaction and security policy sections of this specification. BPEL deployments within a Switchyard application use the standard BPEL schema from this spec. We have our own implementations of these via the standard SCA extension mechanism. If customers are really interested in the standard version of these, we can always have a look. No plans to do anything with these at the moment. The OASIS MQTT TC is producing a standard for the Message Queuing Telemetry Transport Protocol compatible with MQTT V3.1, together with requirements for enhancements, documented usage examples, best practices, and guidance for use of MQTT topics with commonly available registry and discovery mechanisms. The standard supports bi-directional messaging to uniformly handle both signals and commands, deterministic message delivery, basic QoS levels, always/sometimes-connected scenarios, loose coupling, and scalability to support large numbers of devices. Candidates for enhancements include message priority and expiry, message payload typing, request/reply, and subscription expiry. As an M2M/Internet of Things (IoT) connectivity protocol, MQTT is designed to support messaging transport from remote locations/devices involving small code footprints (e.g., 8-bit, 256KB ram controllers), low power, low bandwidth, high-cost connections, high latency, variable availability, and negotiated delivery guarantees. For example, MQTT is being used in sensors communicating to a broker via satellite links, SCADA, over occasional dial-up connections with healthcare providers (medical devices), and in a range of home automation and small device scenarios. MQTT is also ideal for mobile applications because of its small size, minimized data packets, and efficient distribution of information to one or many receivers (subscribers). For more information on the MQTT TC, see the TC Charter. Try the Switchyard Labs with Fuse Service Works. 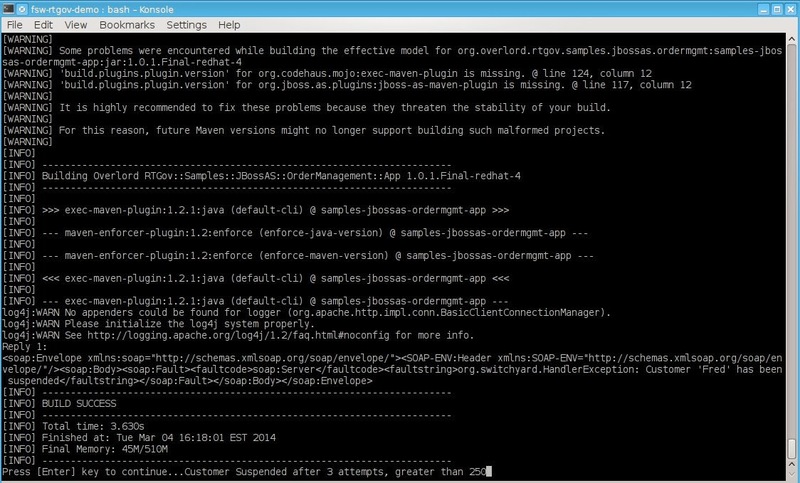 These labs were originally part of a SOA training lab at Red Hat Summit 2013. The labs and guides have been updated to work with SwitchYard 1.0.0.Final. There are four labs in this training. Each lab has it's own SwitchYard project and associated lab guide. The lab guides are located in the guides/ directory. Mark Drilling did an excellent article : Provision Data Virtualization on OpenShift and Connect from Teiid Designer. The article shows to how to provision an instance of Data Virtualization 6.0 on OpenShift and connect to it from Teiid Designer / JBoss Developer Studio. The speed of business change continues to increase, and you need to increase your business intelligence (BI) development productivity to keep up. Data virtualization results in BI systems with simpler, and more adaptable architectures. Learn how in this webinar. It didn’t happen overnight, but a new era for business intelligence (BI) has arrived. The technology and business requirements have changed. Gone are the days when it could take months to develop a new BI system. This webinar explains data virtualization and how its lean form of on-demand data integration results in BI systems with simpler and more agile architectures that can be adapted to new business challenges more effectively. Rick van der Lans, managing director, R20/ConsultingRick is an independent consultant, author, and lecturer specializing in data warehousing, business intelligence, big data, data virtualization, and database technology. He has written the industry's first independent book on data virtualization titled, “Data Virtualization for Business Intelligence Systems: Revolutionizing Data Integration for Data Warehouses.” Rick has advised many large companies worldwide on defining their data warehouse, business intelligence, and SOA architectures. He is the chairman of the European Enterprise Data and BI and Conference and writes regularly for B-eye-Network.com. Syed Rasheed, solutions marketing manager, Red HatSyed coordinates marketing, evangelism, and consulting activities. In addition to helping customers address integration challenges, he is responsible for working with customers, partners, and industry analysts to help Red Hat technology meet customer requirements for business process automation and integration solutions. In his 18 years in the IT industry, Syed has extensive experience in business process management systems, business intelligence, and data management technologies. His work spans the financial services, banking, and telecommunication industries. 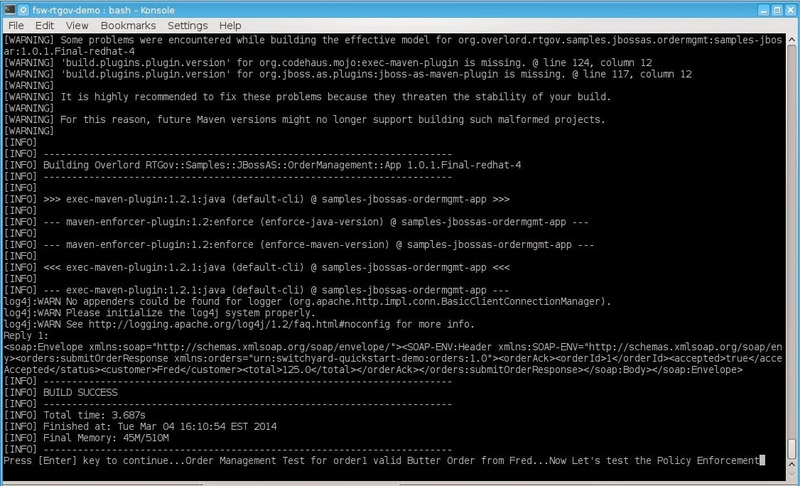 Step 4: Modify the support/InstallationScript.xml file to contain the full path to the installed/fsw directory. Make sure to leave the installed/fsw directory. 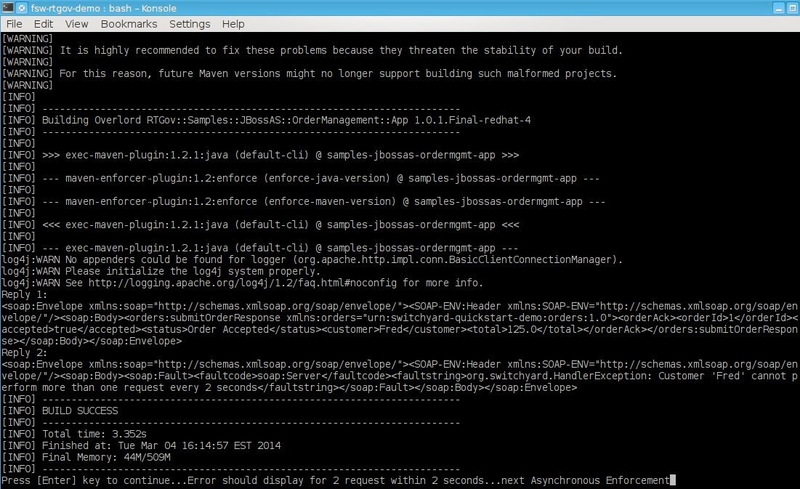 The script performs the automated install of Fuse Service Works. NOTE: This is installing the Switchyard, DTGov, S-RAMP and RTGov components which wouldn’t be the recommended setup as Design Time would be a separate server from the Switchyard/Run Time Server. Step 5: Modify the post-run.sh file to have the appropriate directory for the quickstarts. Step 7: Open another terminal and run the post-run.sh script. This will kick off the individual examples. A. First we deploy the application and information processor. The accepted status from the response should be true. B. Next we will show the Synchronous Policy Enforcement to see that orders from Fred cannot be performed more the 1 request every 2 seconds. C. Next we will show the Asynchronous Policy Enforcement to see that a customer will be suspended after 3 attempts that goes over a threshold. A make payment is done in order to continue orders. 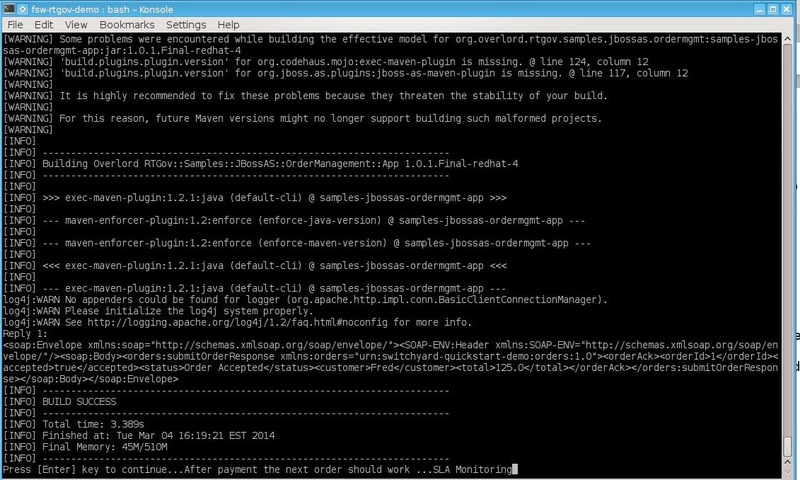 D. Next we will show SLA Monitoring. 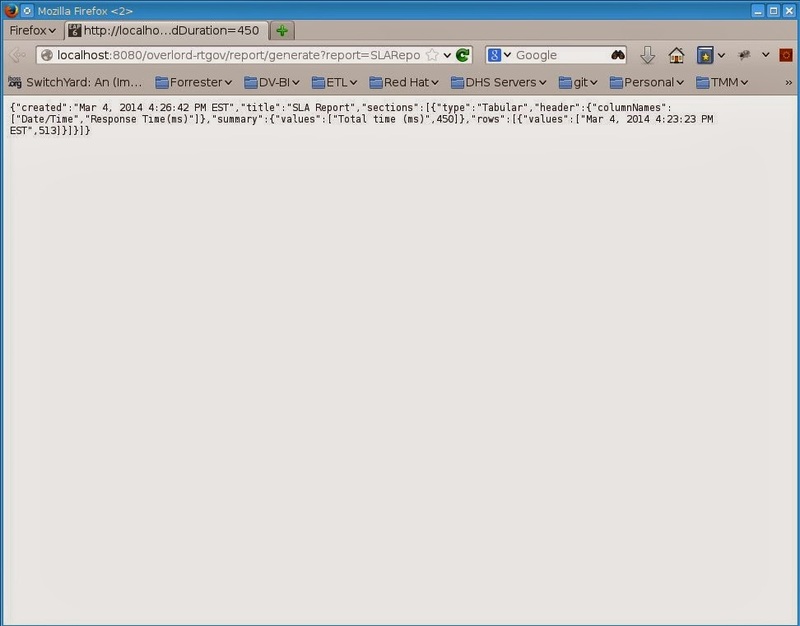 The “Situations” active collection will report SLA violations to the end user through REST or JMX. We will use REST. 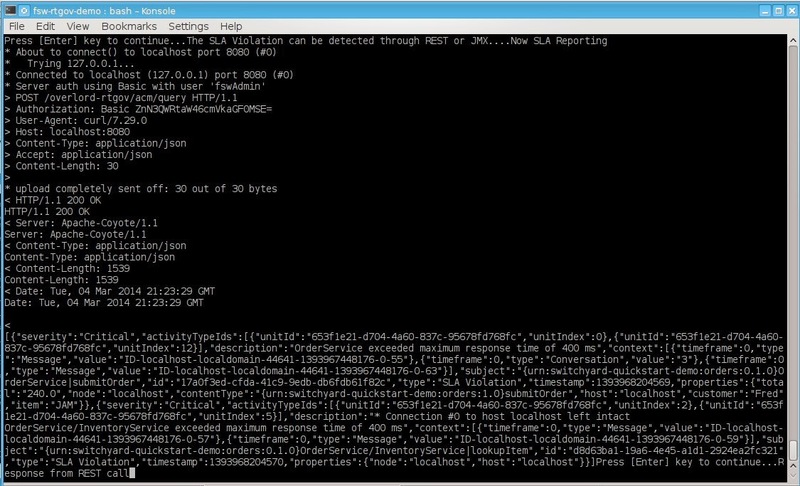 E. Next we will show SLA Reporting. We will generate a report which will return the violations that occured in year 2014. This is a quick demo of Run Time Governance. More detail of configuration and step by step are below. This was compiled from http://docs.jboss.org/overlord/rtgov/quickstart/1.0.0.Final/html_single/index.html and https://access.redhat.com/site/documentation/en-US/Red_Hat_JBoss_Fuse_Service_Works/6/html-single/Development_Guide_Volume_3_Governance/index.html. Activity Server - this component provides a store and query API for activity information. If not using the Activity Collector, then activity information can be reported directly to the server via a suitable binding (e.g. REST). Event Processor Network - this component can be used to analyse the activity information. Each network can be configured with a set of event processing nodes, to filter, transform and analyse the events, to produce relevant rules. The step by step will be added in the next version. Join Syed and Mike for a Red Hat and Jaspersoft Webinar! Business intelligence (BI) teams face increasing pressure for faster time-to-value and shorter cycles to deliver decision making platforms. Hence the question in IT is shifting from how to build a data warehouse to how to speed delivery of insight and how to meet new requirements without breaking the bank. IT needs a platform that enables centralized and departmental BI/DW teams alike to respond rapidly to new requests and minimizes the temptation of business users to build their own systems outside IT. This requires more flexible platforms, tools and methods that can speed delivery and lower costs. We will introduce and discuss agile data integration and analytics offerings from Red Hat and Jaspersoft to enable IT to meet business demand while lowering cost.